“Chuckin’ Charlie” O’Rourke starred at Boston College, where he passed for 1108 yards and 14 touchdowns and led the 1940 team to an undefeated record and victory in the Sugar Bowl. He was chosen by the Chicago Bears in the fifth round of the 1941 NFL draft and joined the club in ’42, backing up QB Sid Luckman and throwing for 951 yards and 11 TDs. O’Rourke then entered the US Navy for the remainder of World War II and signed with the Dons of the new AAFC in 1946. Dons went 7-5-2 to finish third in the AAFC Western Division. 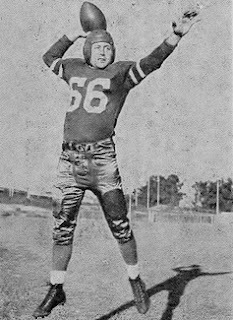 O’Rourke found himself in competition with QB Glenn Dobbs, who was obtained from Brooklyn a week into the 1947 season, but proved the better fit in the T-formation offense and passed for a career-high 1449 yards with 13 touchdowns. With the shift to a spread formation geared to Dobbs in 1948, O’Rouke was sold to the Baltimore Colts where he acted as a player/coach backing up QB Y.A. Tittle for the last two seasons of his career, ending with the dissolution of the AAFC in ’49. Overall in the AAFC, O’Rourke passed for 3088 yards and 28 touchdowns. Of that, 2699 passing yards and 25 TDs came with the Dons.